Wearing our CrossFit Douche Bag costume, we went on a ghost tour with our friends. As we walked around learning about the haunted places downtown, people kept coming up to us and saying we had such a creative and funny costume. People were impressed that we incorporated our dogs in our theme. We were happy that people recognized immediately that they were weights. We have several friends that are CrossFitters. As such, we have been to several CrossFit competitions. As a whole, CrossFitters are a friendly and welcoming community. However, at these competitions, we have encountered the “I think I am better than you because I CrossFit” types. My husband, who enjoys fitness, thought it would be hilarious for us to dress up as those arrogant types. The easiest parts were my husband’s and my costumes. As CrossFit douche bags, we wore items that we already had. We wore gym shirts with arrogant sayings, gym shorts, stance socks, tough mudder, and woman’s head bands. On our shirts, we stapled printed signs that said ‘I am better than you because I CrossFit’ and ‘CrossFit Douche’. 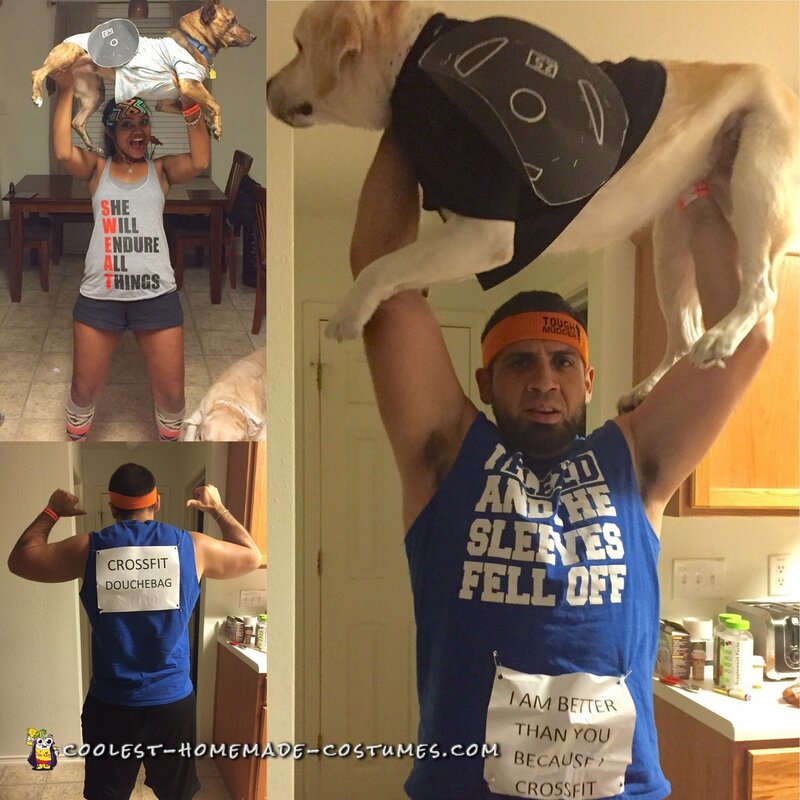 The hardest part of our costume was figuring out how to get the weights to stay on or dogs. As we were going on a ghost walk, we wanted to make sure our dogs were comfortable and could walk easily. We created the weights by tracing weights out of black push sheet. We finally realized that the best solution was having our bigger dog, Sancha, wear an old black shirt of mine to which we stapled the traced weights. As for our smaller dog, Te’o, we found a onesie and stapled the weights to that. We had so much fun being CrossFit douche bags and we were so happy that the weights stayed on our dogs during the 2.5 hr ghost walk. We highly recommend any fitness family to be CrossFit douche bags.